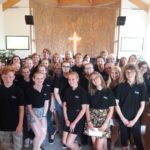 Voice is a Christian charity that gives young people the opportunity to grow in their musical gifts whilst exploring and sharing their faith with others through music. to help children and young people explore and express faith in Jesus through music. to equip young musicians so that they can express their faith as individuals with integrity, honesty and confidence. to seek what it means to worship God not only through our music but with our whole lives. to explore new and fresh expressions of worship to God through music. to enhance the musical skills, understanding and experiences of young people. to bring together young musicians to glorify God through their music. to be a voice in this world for God. In January 2010 a small group of singers and instrumentalists got together to perform in a fundraising concert at their local church. 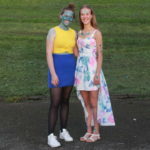 It was such a success and the feedback was so positive that the group wanted to keep going – the first Voice group had been created! 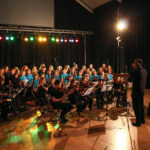 We soon realised that maybe there was a need for high quality music-making opportunities for young people in other areas, especially for those who played orchestral instruments or who were from smaller churches. 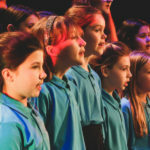 By September 2010 Voice had launched four groups and Voice Youth Choir and Orchestra was created. In June 2011 we trialled a song writing project with our groups that resulted in the recording of our first album ‘Lost Without You’. It became clear that there were some young people with the gift of songwriting who didn’t have the platform to develop this talent and get their music heard by others. As a result, Voice Creative Artists was created to encourage, train and mentor songwriters and give them the opportunity to have their own music recorded and published. We partnered with Scripture Union and Urban Saints to organise our first residential in the Summer of 2012, bringing musicians together from all over the country for a week of making great music, studying God’s word, playing crazy games and having loads of fun. It was a real success and is now becoming an annual event in the Voice calendar. Simon is Director of Voice Music. After studying Music at King’s College London where he gained a first class honours degree, and after completing his PGCE in Secondary Music Education at the University of Cambridge, Simon has worked as Head of Music and Director of Specialism at schools in Essex, Hampshire and the Wirral. He has directed several youth choirs and orchestras and organised many concerts and international tours. He has now left the formal education sector to pursue a variety of projects involving music and young people. Simon is passionate about positively influencing and empowering the lives of others, using music to enrich, engage, inspire and as a means of sharing the truth, love and joy of God. … or with our Standing Order / Gift Aid form.